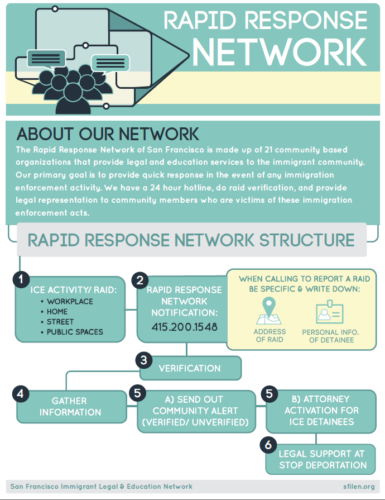 The San Francisco Rapid Response Network is a collaboration between SFILEN and SFILDC. We have organized and implemented this system to respond to the heightened enforcement actions be Immigration and Customs Enforcement (ICE). 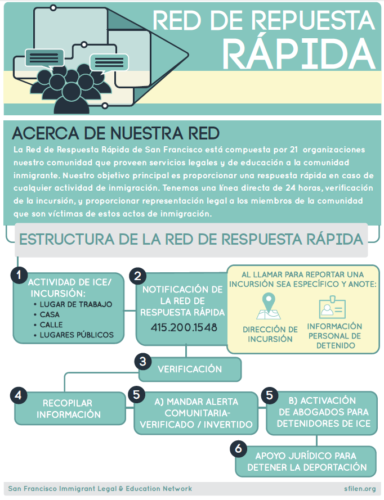 Raid Verification – We do raid verification for all calls of alleged ICE Enforcement activity within San Francisco. Raid verification is an important component of our work in order to dispel myths and lessen fear. We physically go and verify or announce false alarms to rumors about ICE activity. Attorney Activation – If an individual is detained after an ICE raid or ICE Activity we will activate our attorneys to go down to 630 Sansome (immigration processing center) to file for representation of the individual. We will also work to secure long term representation if the person needs it.